When do ninjutsu effects trigger? Thanks a bunch for the solid suggestion and +1, TheRoaringRegisaur! I'm considering Chart a Course . 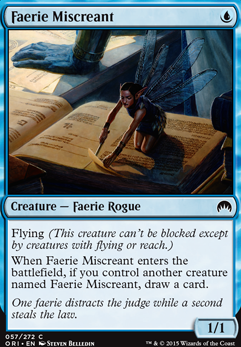 I will point out that there is some draw card built into the deck with Faerie Miscreant (which can even recur with Immortal Servitude !) and pseudo draw card with Squadron Hawks. The Squadron is very powerful here, keeping at least one new creature hitting the battlefield for up to three more turns. There's also Dovin, Grand Arbiter 's ultimate, which isn't particularly difficult to achieve. Consider expanding on the strategy of little creatures with evasion especially flying and adding extra turn spells? All my card suggestions will be budget ($5 or less each). Yavimaya Coast : ETB (enters the battlefield) untapped to make blue or green mana, great with so many one drop creatures. Botanical Sanctum ETB untapped turn one to turn three to make blue or green mana. 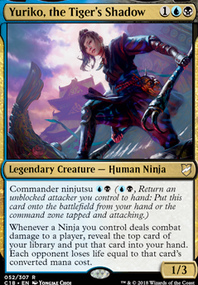 Tetsuko Umezawa, Fugitive : makes all your creatures with 1 power or toughness unblockable. Cloud of Faeries : untap two lands is great with lots of one drop creatures. Llanowar Elves : mana dorks are nice for ramp and can become unblockable with Tetsuko. Eternal Witness : recur any card from your graveyard. Beast Whisperer : more good repeatable draw when casting so many little creatures. Skullclamp : most creatures here have 1 toughness making Clamp great backup draw. Regrowth : recur any card from your graveyard. Karn's Temporal Sundering : works well when Edric is on the battlefield. Walk the Aeons : most expensive price card I'm suggesting, but the buyback is very helpful. It's not exiled after cast, it can be recurred. Can add all these cards for about $30. 40 lands is a lot of lands when playing so many one drops. Most of these possible cuts are draw spells. These spells are fine, but I don't think you need all of them because you have Edric. 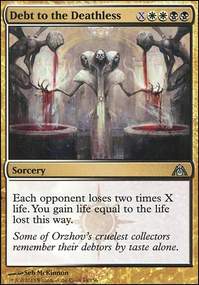 They can be replaced with more low CMC creatures to make Edric better. I also think extra turn spells give you more than these draw spells as well as other high CMC cards. Having an extra turn to attack thus draw again is very good with the strategy of attacking and drawing with Edric. The list overall feels weak. In order to make it, you are eschewing what makes a Delve(r) deck in Modern good, while also being unable to include what makes the same deck good in Pauper. So, it ends up not being made for any format. You are more likely to have success with a UR build. You can leverage the 8 faerie package of Faerie Miscreant and Spellstutter Sprite , while also including burn options, including the new Skewer the Critics since flying fae enable it easily. You have the same options, but there are many powerful commons in red. Heck, if you have the money for it, you can even run Skred and snow basics too. I now realize I forgot to add Daze to the above list, and I also forgot the Chainer's Edict from black that is also unavailable. Have you ever tried playing Psionic Blast? Nobody expects burn in mono blue. 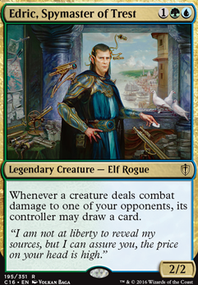 Taigam's Scheming and/or Contingency Plan: put some auras in your graveyard for Bruna while still keeping the cards you want on top of your library. Nightveil Spectre? : Continuous surveil triggers to get auras in your graveyard. Dream Eater: A Large surveil, some control and then a 4/3 flier afterwards. Flash is also nice. Octopus Umbra: An extra totem armor. 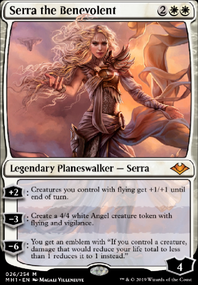 Plus, it basically gives Bruna +3/+3 and allows her to tap any flying creatures your opponent(s) may have. Danitha Capashen, Paragon: Easier to cast auras and equipment. Also, a 2/2 first strike vigilance lifelink is pretty nice. Maybe Fumble To steal your opponents auras and equipments, as well as for control. 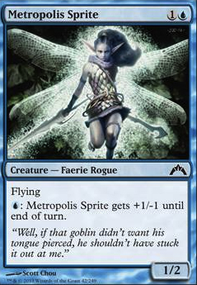 Cards to remove: - Faerie Miscreant for obvious reasons. Perhaps add nightveil or Danitha in it's place. - Pull from Tomorrow if you add Contingency Plan/Taigam's Scheming - Angelic Edict: bit too costly.